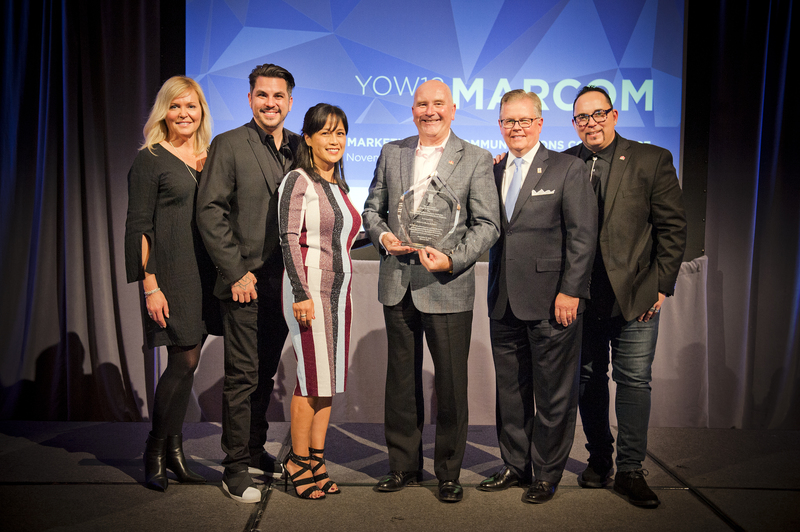 OTTAWA – Airports Council International-North America (ACI-NA) announced the recipients of the 2018 Excellence in Airport Marketing, Communications, and Customer Service Awards on November 15, 2018, at an award gala during the 2018 Marketing and Communications Conference in Ottawa, ON. Hollywood Burbank Airport received the 2018 Peggy G. Hereford Award recipient as the airport with the most overall recognition in the contest’s categories. The Excellence in Airport Marketing, Communications, and Customer Service Awards recognizes the quality of work, abundance of talent, and creativity within the marketing, communications, and customer service field of the airport industry. This year the contest received more than 300 entries in 20 categories. Regarded throughout the airport industry as the highest honor an airport can earn for marketing and communications excellence, the Peggy G. Hereford award recognizes overall creativity in communicating the airport’s message, effectiveness in connecting with audiences, and the overall scope of the airport’s effort in marketing and public relations. A founding member of the ACI-NA Marketing and Communications Committee, Peggy G. Hereford championed the notion that adventure and spirit of aviation should inspire the ways airports tell their stories to the world. She served as the Public Affairs Director at Los Angeles International Airport, where she was the first woman to head the public relations department for a major U.S. airport, retiring in 1977. In addition to being named the 2018 Peggy G. Hereford Award recipient, Hollywood Burbank Airport was awarded first place wins in the categories of Brand Identity, Digital Advertising, Print Communications, and Overall Marketing Programs. This category recognizes excellence in the design and publication of an airports’ annual report. The annual report should project a positive image for the airport through well-written and well-organized content, excellent design, and well-conceived overall packaging. The 2018 winners for Annual Reports are Minneapolis-St. Paul International Airport and Savannah/Hilton Head International Airport. Edmonton International Airport received an honorable mention. New for 2018, this award recognizes the value of partnerships between airports when undertaking marketing, public relations, and customer service initiatives. The 2018 winners for Best in Airport Partnerships are Tampa International Airport and Metropolitan Washington Airports Authority. Miami International Airport and Key West Airport received an honorable mention. This category recognizes excellence in demonstrating the visible elements of an airport’s brand that together identify and distinguish the brand in the minds of airport passengers. The 2018 winners for Brand Identity are Hollywood Burbank Airport, Huntsville International Airport, and Jackson Municipal Airport Authority. Wilmington International Airport received an honorable mention. This category recognizes airports with the most creative and effective community outreach and aviation education programs conducted online, inside, or outside the airport. The 2018 winner for Community Education and Outreach is Reno-Tahoe International Airport. Edmonton International Airport, Vancouver International Airport, Mineta San Jose International Airport, and San Diego International Airport received honorable mentions. This category recognizes passenger-facing technological innovations inside and outside the terminal including mobile websites, mobile apps, and other innovations with the best overall design, functionality, and clarity. The 2018 winner for Customer Service Technology Innovation is Tampa International Airport. San Francisco International Airport received an honorable mention. This category recognizes excellence in web and social media advertising that promotes the airport, including giveaways, contests, and other promotional initiatives. The 2018 winner for Digital Advertising is Hollywood Burbank Airport. Memphis International Airport received an honorable mention. This category recognizes excellence in print or digital newsletter communications. The 2018 winner for is Québec City Jean Lesage International Airport. Edmonton International Airport received an honorable mention. The ever-changing nature of the aviation industry has created opportunities for airports and airlines to work together. This category recognizes excellence in airport and airline partnerships in the areas of communications, marketing, and customer service. The 2018 winners for Partnering with Carriers are Cincinnati/Northern Kentucky International Airport and Dallas Love Field. Ottawa International Airport, Vancouver Airport Authority, Pittsburgh International Airport, and St. John’s International Airport received honorable mentions. As airports work to enhance the customer experience, this category recognizes excellence when airports and concessionaires/service providers to work together. The 2018 winner for Partnering with Concessionaires/Service Providers is Milwaukee Mitchell International Airport. Phoenix Sky Harbor International Airport received an honorable mention. This category recognizes excellence in brochures and print advertising that may be general or targeted to a specific event, industry segment, or special offer. The 2018 winner for Print Communications is Hollywood Burbank Airport. Vancouver International Airport received an honorable mention. This category recognizes successful results of using merchandise to promote the airport or a specific initiative. The 2018 winner for Promotional Items is Minneapolis-St. Paul International Airport. Pittsburgh International Airport received an honorable mention. This category recognizes in radio advertising. Ads may be general or targeted to a specific event, industry segment, or special offer. The 2018 winner for Radio Advertising is Milwaukee Mitchell International Airport. Reno-Tahoe International Airport received an honorable mention. This category recognizes excellence in communications surrounding any irregular or otherwise unscheduled operation or event. The 2018 winner for Responsive Communications is Miami International Airport. Asheville Regional Airport and San Antonio International Airport received honorable mentions. This category recognizes campaigns that connect people through social media and allows them to be integrated in a product, service or overall airport experience. The 2018 winner for Social Media Campaigns is Metropolitan Knoxville Airport Authority. Orlando International Airport received an honorable mention. This category recognizes excellence in planning and executing unique special events in pursuit of the airport’s mission. The 2018 winner for Special Events is San Luis Obispo County Regional Airport. Chicago O’Hare International Airport received an honorable mention. This category recognizes best overall production of an airport video, film, web commercial, or television commercial. The 2018 winners for Video and Film Productions are Baton Rouge Metropolitan Airport and Asheville Regional Airport. Vancouver International Airport received an honorable mention. This category recognizes outstanding website from a design, communications, accessibility, and navigation standpoint. Entrants must demonstrate the website’s overall effectiveness. Please submit the link to your website and, if necessary, any passwords to view. Submissions that include new or special features introduced within the past year are encouraged. The 2018 winner for Websites is Minneapolis-St. Paul International Airport. Québec City Jean Lesage International Airport received an honorable mention. This category recognizes excellence in overall approaches to delivering airport customer service. Eligible entries for this category include new elements to current programs, or new programs developed in the customer service arena that have significantly enhanced the overall passenger experience at the airport. This award is given in three categories: Large Airport, Medium Airport, and Small Airport. The 2018 winners for Overall Customer Service Programs are Los Angeles International Airport (large airports), Pittsburgh International Airport (medium airports), and Huntsville International Airport (small airports). Miami International Airport (large airports), St. Louis Lambert International Airport (medium airports), and Tallahassee International Airport (small airports) received honorable mentions. This category recognizes excellence in overall approaches to airport marketing and promotions by defining a product or service and creating a strategy for communicating the message that will produce growth. This award is given in three categories: Large Airport, Medium Airport, and Small Airport. The 2018 winners for Overall Marketing Programs are Chicago O’Hare International Airport (large airports), Hollywood Burbank Airport (medium airports), and Dane County Regional Airport (small airports). San Francisco International Airport (large airports), Vancouver Airport Authority (medium airports), and Huntsville International Airport (small airports) received honorable mentions. This category recognizes overall approaches to airport public relations and media relations. This is a planned effort to improve the airport’s image in the public eye. This award is given in three categories: Large Airport, Medium Airport, and Small Airport. The 2018 winners for Overall Public Relations Programs are Tampa International Airport (large airports), Vancouver International Airport (medium airports), and St. John’s International Airport Authority (small airports). Miami International Airport (large airports), St. Louis Lambert International Airport (medium airports), and Québec City Jean Lesage International Airport (small airports) received honorable mentions.